RNAi Prevents HBV Selection | Yecuris FRG: humanized animals and human hepatocytes platform for your next great discovery. Sci Rep. 2015 Oct 20;5:15259. doi: 10.1038/srep15259. Selection of escape mutants with mutations within the target sequence could abolish the antiviral RNA interference activity. Here, we investigated the impact of a pre-existing shRNA-resistant HBV variant on the efficacy of shRNA therapy. 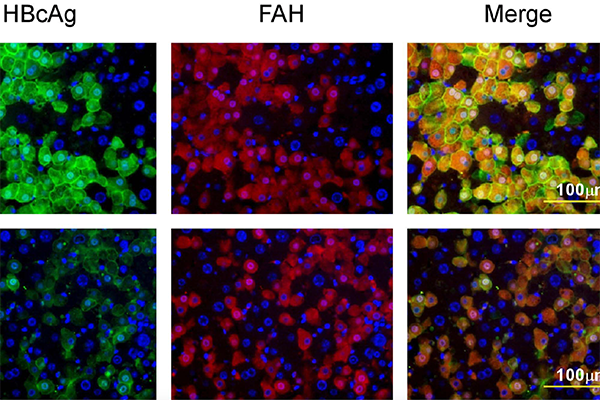 We previously identified a highly potent shRNA, S1, which, when delivered by an adeno-associated viral vector, effectively inhibits HBV replication in HBV transgenic mice. We applied the “PICKY” software to systemically screen the HBV genome, then used hydrodynamic transfection and HBV transgenic mice to identify additional six highly potent shRNAs. Human liver chimeric mice were infected with a mixture of wild-type and T472C HBV, a S1- resistant HBV variant, and then treated with a single or combined shRNAs. The presence of T472C mutant compromised the therapeutic efficacy of S1 and resulted in replacement of serum wild-type HBV by T472C HBV. In contrast, combinatorial therapy using S1 and P28, one of six potent shRNAs, markedly reduced titers for both wild-type and T472C HBV. Interestingly, treatment with P28 alone led to the emergence of escape mutants with mutations in the P28 target region. Our results demonstrate that combinatorial RNAi therapy can minimize the escape of resistant viral mutants in chronic HBV patients.